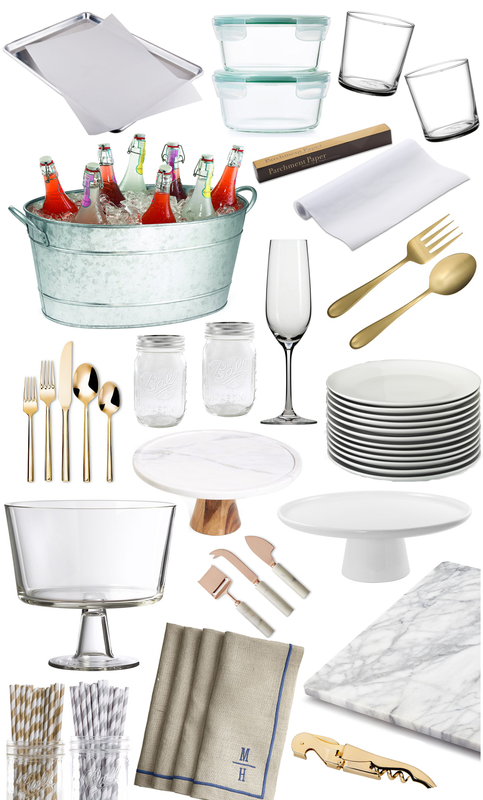 All-Time Favorite Holiday Entertaining Pieces. Thanksgiving is only 10 days away, which is totally boggling my mind! Over the weekend I started to write down a quick list of recipe ideas, items I need to stock up on from the grocery store, and a handful of my favorite entertaining pieces I plan to pack up and take with me when we head to my family’s house! My siblings and parents give me a hard time because I arrive for the holidays as though I needed to bring my entire kitchen with me – but I’m loyal to my favorite cooking tools, and have some go-to entertaining pieces that always make prep and serving easier. I ‘ve done a post before on my cooking essentials, and thought it would be fun this year to share my all-time favorite entertaining pieces to expand my list! Prep pieces. Probably the most versatile and frequently used kitchen item in my tool kit is a ¼ sheet pan — I use them for everything! They’re perfect for resting meat, tossing veggies with seasoning, toasting or baking. I even sometimes use them as serveware too, with a piece of parchment paper on them, they have a laid-back vibe to them and are great for serving appetizers on. Another must-have for prep work is parchment paper. I typically splurge and buy the Reynolds pre-cut sheets because they speed up my work and fit my baking sheets perfectly. When we host a party I re-use the same baking sheets over and over again during a party when I’m heating up appetizers and simply swap out a fresh sheet of parchment paper between each bake. A big prep-work lifesaver is quality glass storage containers –- we switched to glass Tupperware a few years ago and they’re much easier to clean, and can hold hot ingredients much better than plastic! Barware. While I’m an actual barware accessory hoarder (the paper straw collection is almost out of hand!) I typically keep my glassware selection for entertaining fairly simple. I have a set of low tumblers that incredibly versatile and work as a wine glass, are perfect for mixed drinks, and I sometimes even use them as individual serving vessels for layered desserts! You’ll see a lot of restaurants use these glasses now, and it’s because they’re real workhorses and can be used for so many things. My one specialty glassware item that I believe you can never have enough of is champagne glasses – drinking out of a champagne glass just says “it’s a party!” – and because I don’t want to be fussy about them breaking I have cases of inexpensive ones from Pottery Barn’s catering collection that durable and most importantly, easily replaceable. The other must-have barware item I rely on is a good party-bucket for holding ice, wine bottles, beer, and mixers – an inexpensive but attractive looking bucket can really dress-up a bar. Serving Pieces. When we got married we registered for pretty classic, everyday flatware and serving tools – so there isn’t much in the way of formal silver or place settings when we entertain. My motto has always been to stick to the basics – which means super sturdy and classic white dishes (I love that if these break I can always add more to our stash! ), that aren’t too precious and can be loaded up into the dishwasher. Keeping the dishware and barware classic and clean gives me the opportunity to mix in more “on-trend” pieces for different tablescape options. Right now I love gold flatware and gold serving tools that dress up my everyday pieces. Layering in fresh, colorful textiles can also change your tablescape look. My other mainstay in my serveware arsenal is a variety of cake stands. I use cake stands for so much more than just displaying desserts – they’re awesome for displaying appetizers, elevating coffee bar or barware tools, even for building a tablescape that needs some more height. A few of my favorite cake stands are classic white, marble, and jadeite. The workhorses. I have a few less traditional entertaining pieces that I always have up my sleeve when hosting – these pieces stray from the typical serving trays and bowls, but are so helpful because they can be used in tons of ways. The first piece I go to again and again is a marble pastry board. It serves a great purpose for baking, but I also like to chill mine and use it as a serving board for cheese plates, crudité, and other appetizers. Another multifunctional piece I use time after time is a footed glass bowl or trifle dish – it makes such a visual impact for a layered dish like a fruit salad, green salad, or a classic tiered dessert. I’ve even used them for small batches of punch on the bar cart! My most versatile entertaining piece has to be my collection of mason jars. I could list 100 ways I’ve used them, from vases, to individually portioned desserts, to storing dressings and simple syrups – I always have a variety of sizes on hand. The fun stuff. All of the entertaining piece I’ve listed above are real classics – the pieces I use year round, time after time. There’s always room to mix things up and bring in new colors, details, and décor when entertaining, so I layer on a few fun pieces that compliment my entertaining staples. I’m a sucker for collecting fun cheese knives and different tiny serving spoons and forks for appetizer platters. I mentioned above that linens are my go-to option for dressing up classic white serveware – World Market has an amazing range of colorful buffet napkins (they’re so inexpensive too!) and a high-quality monogrammed linen napkins can always elevate a table setting. My bar cart is where I have the most fun, with dozens of different types of paper straws, drink stirrers, and bar tools that help me customize cocktails at each and every event! Spiced Clementine Cocktail. A Cranberry Friendsgiving Feast. 2 Responses to "All-Time Favorite Holiday Entertaining Pieces."